I recently visited Jasper National Park, one of the worlds largest dark sky preserves, during their 3rd annual Night Sky Festival. I was lucky enough to have two clear nights to explore and shoot as many photos as possible to create a short timelapse while there. During the day, I took a bit of time to check out the awesome events planned for the festival, which included presentations from Discovery Channel's Jay Ingram, astronomer David Levy, science journalist Peter Mcmahon, and the great Northern lights photographer Yuichi Takasaka. I was lucky enough to catch David's presentation about all of his comet discoveries. I've got to say, being in the same room as someone who is responsible for discovering 23 comets was quite the treat. In addition to the presentations, there were also sky gazing events and a beautiful night orientated art showing. Both truly unique and exciting experiences. 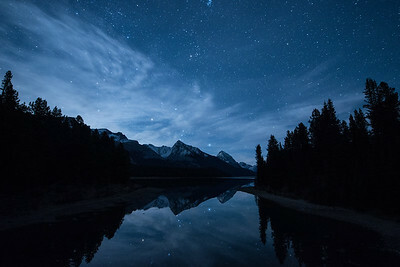 The star gazing event at Lake Annette was full of friendly amateur and professional astronomers eager to share a view of the night sky through their telescope. I met seasoned dark sky party veterans as well as families attending for the first time; all sharing the same excitement. The art show, at Pyramid Lake was probably one of the coolest art exhibits I've seen. Red lights illuminated the pathway and as you would imagine, all white light was off-limits to help keep all eyes adjusted for the dark. After checking out as much of the festival as I could, I scouted locations during the day and then made my way out to get to the first place of my list before it was dark. I stayed out shooting and moving from location to location each night until just before sunrise. The weather didn't cooperate for my third night, but In the end, I took over 2,000 photos at locations such as Lake Annette, Athabasca Glacier, Pyramid Lake, and many others. Out of all the places I've traveled in search for dark skies, Jasper definitely offered some of the best views I've ever seen. 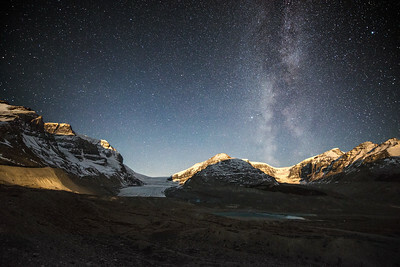 The sky in the Columbia Icefield area was unlike any I had witnessed before. Thanks to Yuichi and Peter for taking me there! Although my visit was brief, I really felt a connection to the park and the festival. It was great to be around so many people that were excited about astronomy and preserving the night sky. The festival in 2014 already has Chris Hadfield lined up as a guest, so they're definitely moving forward full force and they've definitely got me excited to go back! I hope you enjoy the timelapse and maybe even decide to plan a trip to see it all for yourself.